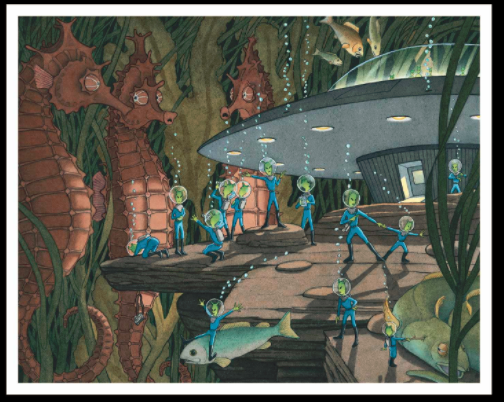 During our BIG READ EVENT, Willow class read the book Flotsam by David Wiesner. Deep within the forest of kelp lives a small village of diminutive, green beings, watched over by silent seahorse sentinels. Fascinated, the children run, excited by the intriguing wildlife. Gawping into their miniature house, huge fish stare silently, looking at the small invaders of their home territory. Resisting the constant irritations, a large eel lays silently on the seabed. With their unwavering eyes, the seahorses stare at the small photographers who are staring in awe. Gliding through a tropical, light-blue sea, a flotilla of mighty turtles came into view. Upon the back of the tropical turtles lay a shell city, infested with little, green aliens. The colourful city of orange, red white and brown had a spiral point upon each house. At the bottom of the aqua-blue ocean stood a strange, shell city. 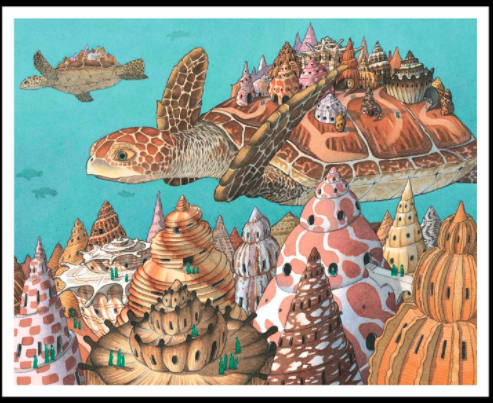 In the depths swam a flotilla of turtles, with a range of colourful, diminutive shells carried upon their backs. The shell homes were inhabited by miniature people, who roamed their spiralled city.